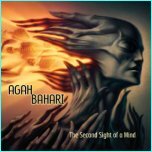 Agah is a virtuoso guitar player from Iran who ended up in Canada. He has hooked up with some other great musicians, with who he is not afraid to show their chops as well and gladly makes room for their playing. The music is pretty hard rocking and is heavy metal at times but a lot of moods are mixed in as well. Most of the tracks feature very complex interplay between the keyboard player, Derek and Agah. Derek Sherinan co-produced the CD and Agah wrote all the songs. Agah’s playing often reminds me of Joe Satriani mixed with Lindsey Boullt. I would have expected a few more Middle Eastern themes to have entered into the music but there are a few, like Orgasmic Sense of Insanity and Protectors Caravan. Everlasting Perfection is a more laid back track with some nice fretless bass and more melodic and bluesy guitars. I really like the title track a lot. Amazing. The CD ends with the short Heat Death. Talented folks.